The author of this book is al-Barbahāree, and his name is: al-Hasan bin ‛Alī bin Khalaf al-Barbahāree, this title being an affiliation to “Barbahār” which is a type of medicine, so perhaps he used to work in the field of medicines or sell it. He was from the major Hanbalee scholars taking knowledge from those who studied under Imām Ahmad bin Hanbal, such as al-Marroozee and others. He studied thoroughly, and delved deeply into knowledge. He acquired the ‛aqīdah, fiqh and other knowledge from the great scholars. The title of the book is Sharh as-Sunnah, i.e. Explanation of the Sunnah – the intent of the term Sunnah here is The Path of the Messenger. The intent here is not that of the terminology employed by the Scholars of Hadīth who state: “The Sunnah is whatever is affirmed upon the Prophet of statements, actions or tacit approvals,” rather the intent is more general, that being: The Path of the Messenger, The Path of his Companions and the Path of the Pious Predecessors (as-Salaf as-Sālih) – and this is the Sunnah that has been transmitted and passed down, whether it be in belief, in worship, in fiqh, or in manners and ettiquette. All of this is referred to as the Sunnah in a general sense. Occassionally the author may make mention of affairs connected to fiqh such as wiping over the socks during wudhoo and the temporary marriage for the purpose of refuting the misguided sects in opposition these affairs. He may repeat and reiterate certain affairs for the purpose of emphasis or relevance or further elaboration, or another knowledge-based purpose – so in general it is a beneficial book. What follows is a mention of its importance from the aspect of its age – it is from the books of the Pious Predecessors of old who lived in the era of the Great Imāms, who took knowledge from them and transmitted their pure ‛aqīdah, so may Allāh’s Mercy be upon the honorable Imām. The word, “Explanation (Sharh)..” in the title of the book means “Clarification”. It does not mean that al-Barbahāree is about to explain a specific book, or to write a commentary on a book. Rather its meaning is that he is making clear the Path of the Sunnah – this is the meaning of the title Sharh as-Sunnah. The early scholars would entitle the books of belief, “as-Sunnah” such as this book, or such as as-Sunnah of Imām Ahmad, as-Sunnah of his son ‛Abdullāh, as-Sunnah of al-Athram, Sharh Usool I‛tiqaad ahlus-Sunnah wal-Jamā‛ah of al-Lālikā’ee. Likewise they were entitled “al-Īmān”, so some books would have chapters entitled Kitāb al-Īmān, such as is present in Sahīh al-Bukhāree and Muslim – they would include into their works chapters entitled, Kitāb al-Īmān, placing therein that with is specific to the ‛aqīdah: Belief in Allāh, His Angels, His Books, His Messengers, the Last Day, the Pre-Decree, its good and evil. Other books were entitled “ash-Sharī‛ah” such as ash-Sharī‛ah of Imām Ājurree ash-Shāfi‛ee. Others were entitled, “at-Tawhīd” such as Kitāb at-Tawhīd of Ibn Khuzaimah and the well-known books of Tawhīd. And they were called“al-‛Aqīdah” which is the firm belief of the heart, by which one’s practices his religion and is obligated with. There is no differing in these titles – these are merely different names for the same thing. There is no contention concerning these names. If the intent is known then there is no differing. So this is mere terminology and each term has its persepective, so even though the words differ, the meaning is the same. The terms ‛aqeedah and tawhīd have no evidence to support their usage – these terms are not found in the Qur’ān or the Sunnah. This is a doubt they put forth wishing to eradicate the ‛aqeedah – so they brought about this speech so as to remove the distinction between the Sects of Misguidance and the Sect that is upon the Straight Path – and this distinction is what enrages them. Due to this they do not refute the people of falsehood – and this is the actual intent of the educated ones from amongst them. And as for the riff-raff and rabble who take from the cesspits of thinking, then they merely echo this foul speech as occurs in some newspapers and that which is referred to as ‘authorships’! So it is not permissible for one to pay attention to these doubts and this skepticism. As for differing in the affairs of juristic opinion in how to perform outward acts of worship (fiqh) where there is a possiblity of understanding the proofs differently, then this does not harm unity and does not cause division and enmity. This is due to the fact that these variant juristic conclusions (ijtihād) are tolerated, and as for differing in ‛aqeedah then it is not tolerated [in the Religion] – people who differ in the‛aqeedah will never be united ever regardless of how hard they try, because in essence they are attempting to unite opposites, and it is not possible to united opposing and contradictory affairs. So if they truly wish to unite the Muslims together, then they are duty-bound to correct the ‛aqeedah first. Indeed the Messengers of Allāh, from the first of them till the last, gave utmost attention to it and would begin their call with it. So upon them is to be on a united ‛aqeedah first and foremost. So if the ‛aqeedahis united, then the Ummah will be united – this of course if they are serious and true in their claim. However these individuals mock and belittle those who speak concerning the ‛aqeedah and call to the sound ‛aqeedah. They proclaim: “Look at him declaring the people to be unbelievers! He wishes only to divide the Muslims,” and other similar accusations. So this is the place of unity of the Muslims if they are truthful – they will correct and rectify their ‛aqeedah, negating from it deviations and alien notions. We unite upon that which we agree, and we excuse each other in that which we disagree. So division of the Muslims does not come about due to them differing in affairs of fiqh in which it possible to have an alternative understandings. For this reason within the ranks of Ahlus-Sunnah there is the Hanafee, the Mālikee, the Shāfi‛ī, and the Hanbalee. And they did not differ (in the ‛aqeedah) and all praise is due to Allāh, nor separate from each other. This is because the differing amongst them wasijtihād in fiqh, i.e. striving to reach the correct juristic opinion – each one having a viewpoint and evidences that could be used as support. As for the ‛aqeedah, then in their ‛aqeedah they were as one! The Hanbalees, the Shāfi‛ees, the Mālikees and the Hanafīs have one ‛aqeedah, even though amongst their followers there are those who oppose them in the ‛aqeedah. And this opposition is found in the Hanbalees, and in the Hanafees, and in the Shāfi‛ees, and in the Mālikees – there is found amongst them those who oppose the ‛aqeedah of the Imāms. They ascribe only to the fiqh of the Imāms, and as it relates to the ‛aqeedah they oppose them. So these people are not to be counted as followers of those Imāms because they follow them in an affair (i.e. in fiqh) yet they oppose them in an affair that is more important than that (i.e. in the ‛aqeedah). So they are not considered as followers of these Imāms whilst they oppose them in the ‛aqeedah. This is what Allāh guided to by way of the Scholars such as al-Barbahāree and others in describing and illustrating the Straight Path as taken from the Book of Allāh, the Sunnah of His Messenger (salallaahu ‘alaihi wassallam) and the guidance of the Salaf so that the Muslims may proceed upon it. And this is from sincere advice and sincerety to Allāh (the Most High), His Messenger (salallaahu ‘alaihi wassallam), His Book, to the Muslim Rulers and the general folk. He is Ahmad bin Muhammad bin al-Hajāj bin ‛Abdul-‛Azīz Abu Bakr al-Marroozee. Ibn Abī Ya‛lā stated: “His mother was a Marrooziyyah and his father was Khawāzimee (in lineage). He was foremost from the students of Ahmad bin Hanbal in piety and virtue. Our Imām was friendly with him, delighting in his companionship – he took charge of his scabbards when he died and he washed him for the funeral. He narrated from Ahmad plentifully.” Al-Marroozee died in the year 275H. 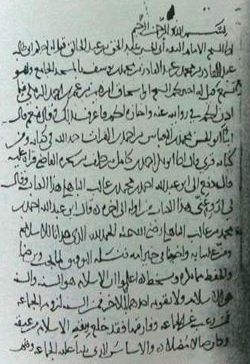 Tabaqāt al-Hanābilah (1/56), Siyar A‛lām an-Nubalā’ (13/173). Refer to his biography in Tabaqāt al-Hanābilah of Ibn Abī Ya‛lā (2/18), Siyar A‛lām an-Nubalā’ (15/90). Translator: Differing in fiqh here refers to matters of jurisprudence connected to the outward acts of worship in which the Salaf may have differed and made ijtihaad, and not to the matters connected to the fundamentals (‘usool). The Companions and those who followed them from the great Imāms did not differ in the fundamentals, whether in belief, statement or action. Translation Copyright Salafi Publications. All rights reserved 2012.